Winter cycling can be a bit dicey without the proper gear and the Northwave Extreme XCM 2 GTX shoes have been just that: Proper gear. The last update on these shoes showed that they were a versatile bit of kit in that I was able to layer socks and use vapor barriers to help extend the temperature range further with this type of shoe than I typically have experienced. With even more time in these kicks, I am now ready to give my final verdict. 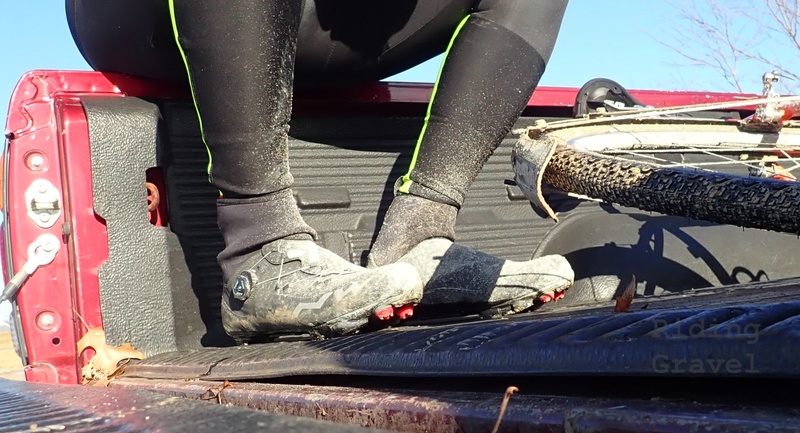 The Northwave Extreme XCM 2 GTX shoes at the end of a recent ride. Ease of Getting In and Out: While Winter wear is always a bit of a chore to put on and take off, the Extreme XCM 2’s made this as easy as I think it could be. Basically they are like taking a sort of tight, heavy sock on and off. This mostly is because of the SLW2 dial and the inner is made like a sock. Generous Volume: The Extreme XCM 2’s have a fairly wide toe box and are easy to vary in snugness with the easy to use SLW2 knob. This allows for layering of socks and the ease of use in vapor barriers. Of course, the width of your foot will vary, and this may decrease this benefit to you somewhat. Stiff Pedaling Platform: The Extreme XCM 2’s pedaling performance is very good. No uncomfortable hot spots, no discernible flex. I also was pleased with the walk-ability of these shoes when forced off the bike to hike it, or just when walking around pre/post ride time. Of course, there were some points that either need improvement or were causes for concern. The Proprietary SLW2 Dial: While I never had any issues with the way it operated, this is a proprietary bit that, if it proved to be an issue, you’ll likely have to track down a Northwave dealer to have it addressed. The lever to release the wire which runs through the SLW2 dial is a bit tiny. I would have liked an easier, perhaps longer lever. It was difficult sometimes to find that little thing “blind” as you are when reaching down to find it when desiring to adjust or remove the shoes. Inner Sock Liner: I had a couple of instances where I heard what sounded like threads breaking/ripping while removing the Extreme XCM 2’s a couple of times. I could not visually see any damage, but obviously something happened. I was left wondering if perhaps the action of removing the shoes was generating enough stress on the inner sock liner to perhaps be pulling it away from the outer part of the shoe? Hmm……… I cannot say for certain. But again- Nothing untoward was seen or felt, and I haven’t experienced that again after the first few times I heard it. Still, that’s concerning………. Leakage: I did find out that the upper portion of the Extreme XCM 2’s, which is that sock-like, Neoprene material, which is exposed around the ankle here, can leak moisture. I experienced this during a ride where there was a lot of melting snow and my front tire, combined with the wind, sprayed my ankle down. That eventually soaked through enough that I got wet. It didn’t cause my ankle to get cold, but it could have. Something to keep in mind. The rest of the shoe, however, was water-proof. A reminder of what these looked like new. At The Finish: The Northwave extreme GTX 2 XCM shoes were some of the best of its class that I have tried, perhaps the best. The good far outweighed the concerning points and I can see no problems using these through several seasons of “transitional” or even mild winter use. (Provided that the sound I heard when taking these off a couple times doesn’t prove more noteworthy) I still wouldn’t call these an all-season shoe solution for those who live in snowy, very cold regions. My best guess is that most folks wouldn’t want to use these in anything much below 25°F unless they can take advantage of the Extreme XCM’s generous volume and layer up. Maybe you have warmer feet, and that would make a difference as well. My feet were very happy pedaling in these kicks. I might be a bit let down if things were wet more often as that upper “sock” portion isn’t water proof, but there are ways around that. (Pants/tights, for one) That said, I can easily say the Northwave Extreme XCM 2 GTX shoes (I still think of these as boots) have moved to the top of the shoe rack and are the shoes I reach for anytime the temperatures dip below 50. 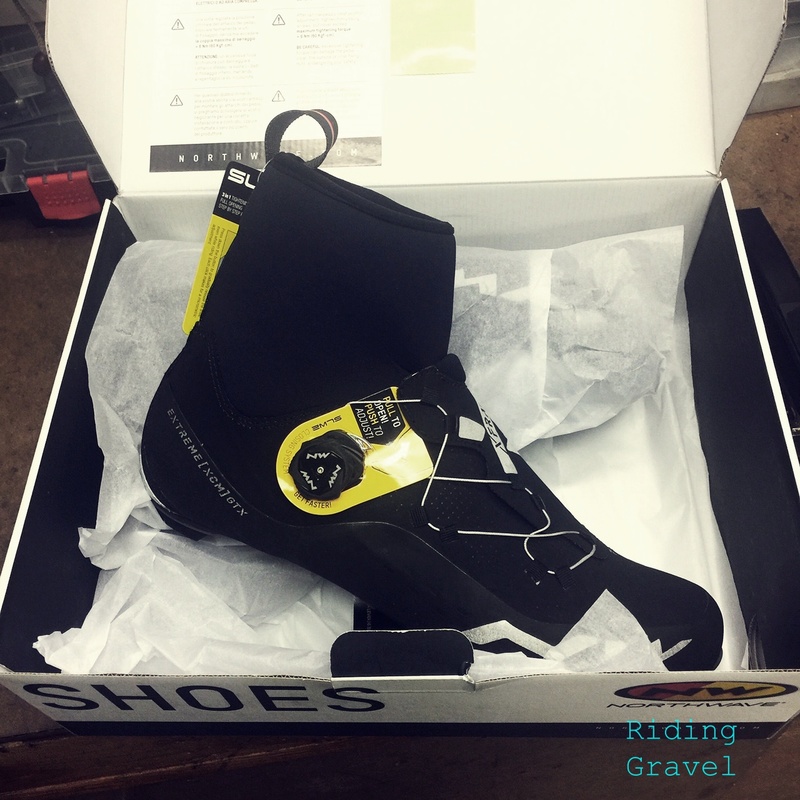 Northwave have simply done a better job of integrating the shoe cover and shoe into one easy to use, very effective, cold weather footwear choice. Note: Northwave sent over the Extreme XCM2 GTX shoes for test and review at no charge to RidingGravel.com. We are not being paid, nor bribed, for these posts and we strive to give our honest thoughts and opinions throughout.